BT's Piper has heard his Last Post. The blue and red man who has been blowing his trumpet for more than a decade, summoning people to the sound of the phone ringing, has run out of breath. Although a recognisable symbol, Piper was not taken to people's hearts. He entered the world to much ridicule, both for the expensive nature of his birth (estimated £50m) and for what some saw as pretentiousness. Observers said he looked like he was knocking back a yard of ale. Others poked fun at his clam-like hands. Perhaps his lack of popularity stemmed from the time in which he was born, an era characterised by widespread cynicism towards rebranding. With his friends - BA's Funky Tailfins and Consignia - his future was perhaps never bright. Pip will join family members Beattie ("You got an ology? "), Buzby ("Make Someone Happy), and that Bob Hoskins character ("It's good to talk") in the great call centre in the sky. 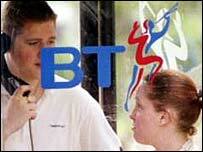 Tribute was paid by a BT spokesman: "The piper has done an excellent job for the last 12 years." Pip was, however, well paid for that work - he cost his employers just over £4m a year. And his final demise came because he was too much of symbol of what BT didn't want to be. He is succeeded by a strange collection of coloured discs, which is designed to symbolise "the connected world". 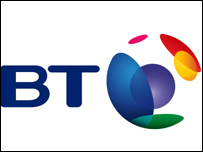 A spokesman said the new logo "reflects a broader world of communications" and was "in tune with the multi-media age". An age in which people no longer use trumpets to communicate. I was told by a Professor of Greek that it was uncertain whether the double-horned instrument ever existed, but featured largely in Greek tragedies. How apt. Everybody I know thinks he looked like a bloke with a massive joint.